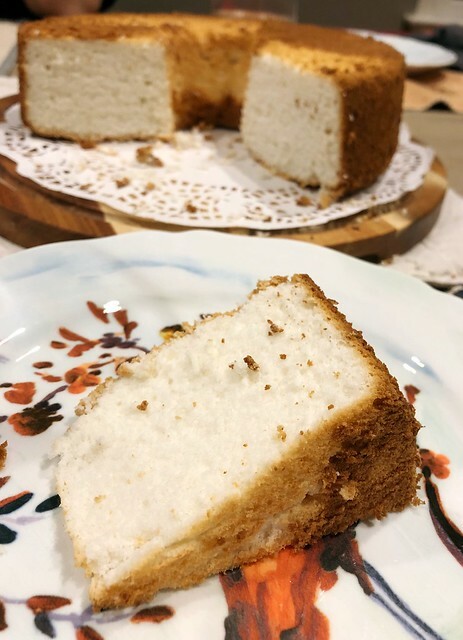 Angel food cake – Come on in, I hope you are hungry! After watching The Lego movie, 6-year-old really wants a Millennium Falcon. Me: You’ll need to save for it, buddy! It’s 100 bucks. 6-year-old (excited after thinking for a while): Mom, I can totally buy it when I lose TWENTY teeth!!! In a small bowl, sift flour, 100 g sugar, and 1/2 tsp salt. In a large bowl, beat egg white on medium speed until foamy. Add cream of tartar and lemon juice. Continue to beat on medium speed. When egg whites form soft peaks, stir in vanilla. Use a spatula to fold flour-sugar mixture. Spoon the batter into the tube pan. Invert the pan on its “feet”. Serve with lemon curd, to jam, or whipping cream, or chocolate sauce, etc.